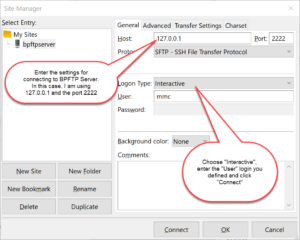 BPFTP Server has the ability to operate as a Windows System Service aka SERVICE-MODE (HOWTO). This is essentially, the same as the normal GUI-MODE that you are used to seeing when you login to the computer and run the application, however it’s running under Session-0 (Windows System Service) and all GUI operations are hidden. 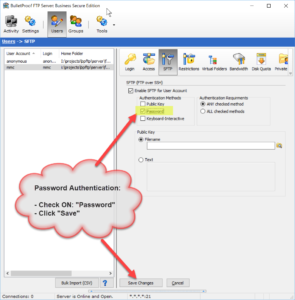 This can make it more difficult to diagnose issues, as the software can only respond via the Windows Event Viewer (start, view) and the BPFTP Server Log (Settings -> Logging -> Settings -> “Saved Log-File Location”). But, why is it not responding or is stuck at 100% ?!?! Can you reproduce the error? Try running the software in DEBUG-MODE and send us the *.csl/*.zip. Don’t just email a giant log file… In order for us to find the issue, please perform the operation that reproduces the error, the date/time (so we can find it) and the symptoms of the issue. LASTLY, and MOST IMPORTANTLY… run the software in the GUI mode, not the SERVICE mode. This will allow the UI to communicate with the desktop, so that you can see what’s going on. This is an absolute must, in order to discover the source of the issue. It doesn’t mean you’ll never be able to run SERVICE mode, only during the testing phase. 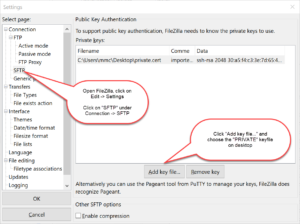 Implicit-Mode is FTP over TLS/SSL and was the first method of encrypting FTP and moves the control-port to 990 where it "implicitly" requires TLS/SSL to be used. Largely replaced by FTPS:Explicit. 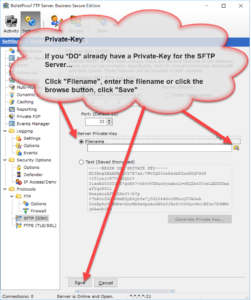 Explicit is FTP over TLS/SSL and allows the ftp-client to turn-on encryption at login via the standard control-port tcp/ip 21. Once encryption is enabled (before login), everything communicated will be sent via TLS/SSL. 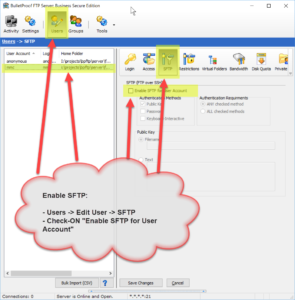 SFTP is FTP over SSH and is an extension of an SSH Server to allow for file-transfers. Considered a stable in the Unix/Linux world, and operating almost identical to "SCP", this protocol is considered industry standard for encrypted FTP. 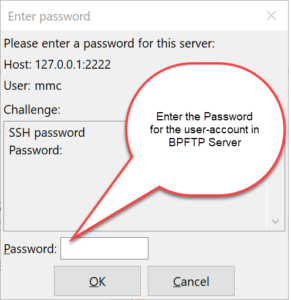 +PASV: In addition to the main port used to login and issue commands, you *must* define and port-forward the data-ports for any ftp-server on the internet and/or operating from behind a firewall. 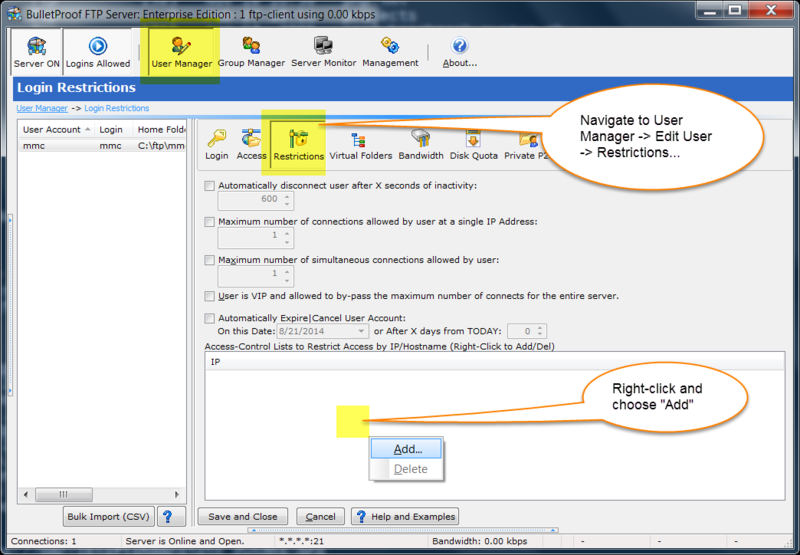 By default, the software is configured to use tcp/ip ports 30000 to 30100. These ports are used to communicate directory-listings and transfer-files. 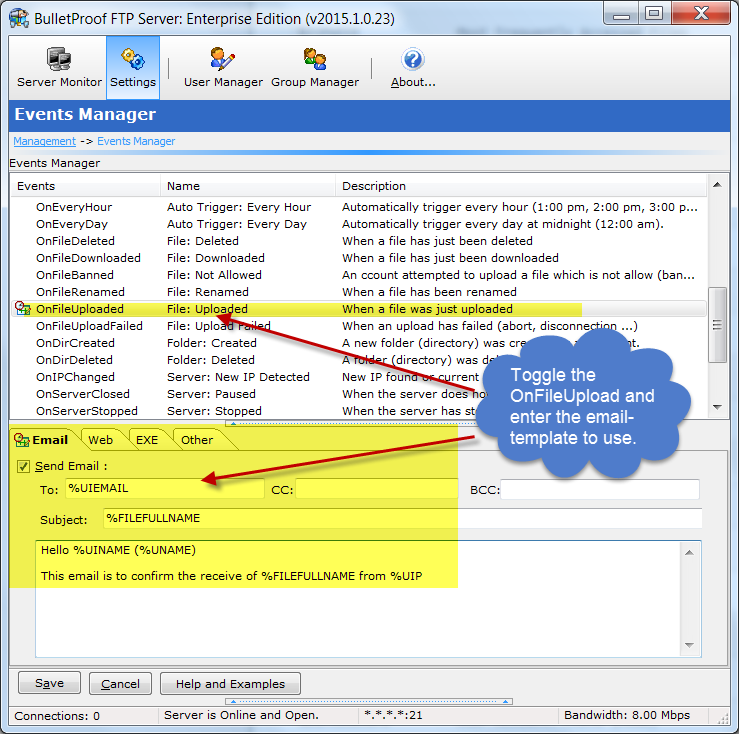 FTP and FTPS 30000 to 30100 Data-Ports used for Data-Connections (directory-listings and file-transfers). These two ports are used for connecting, logging in and issuing commands. 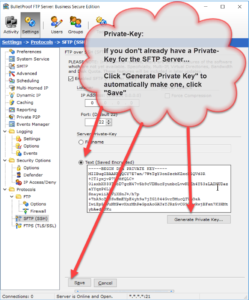 Enabling SFTP is very simple and only requires a Private-Key. 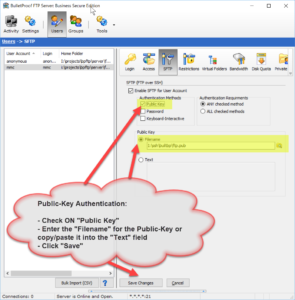 The Private-Key can be loaded via a file or text which has been copy/paste’d into the software (NOTE: text keys will be stored encrypted in the software). In some Windows configurations, it might be necessary to enter the license-code via the command-line. Specifically, in Windows Server where “Internet Explorer Enhanced Security” is turned on (More Info: here, here, here, here and here). 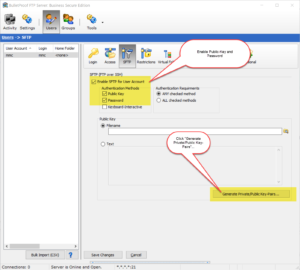 When IE ESC is turned on, you’ll need to turn it off; this is because the dialog-box that appears for entering your registration code uses the IE WebKit and as a result the links won’t work correctly. 3) cd "C:\Program Files (x86)\BulletProof FTP Server"
PLEASE NOTE: All rules should be added as a DENY rule (“-” minus) sign. Entering a ALLOW rule (“+” plus) will override the default rule of “+*.*.*. 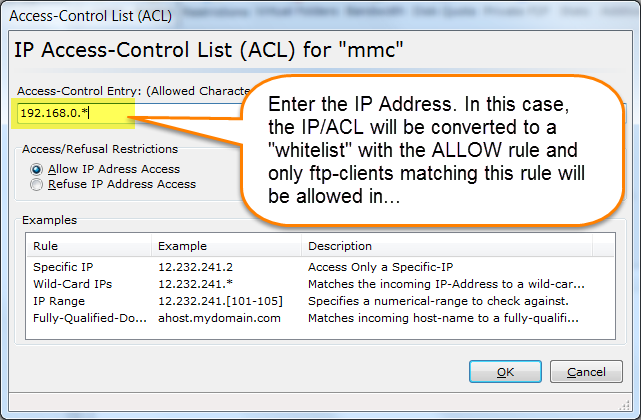 *” and turn IP/ACL into whitelist only, where all IPs are rejected unless an ALLOW rule is created. Enter the IP Address to be banned. 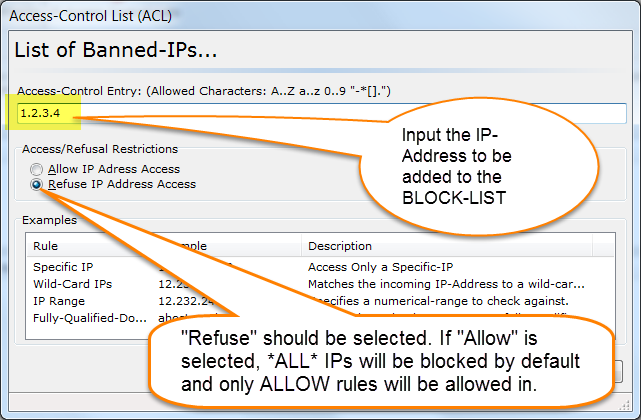 Please note that the “Refuse IP Address Access” should be chosen. 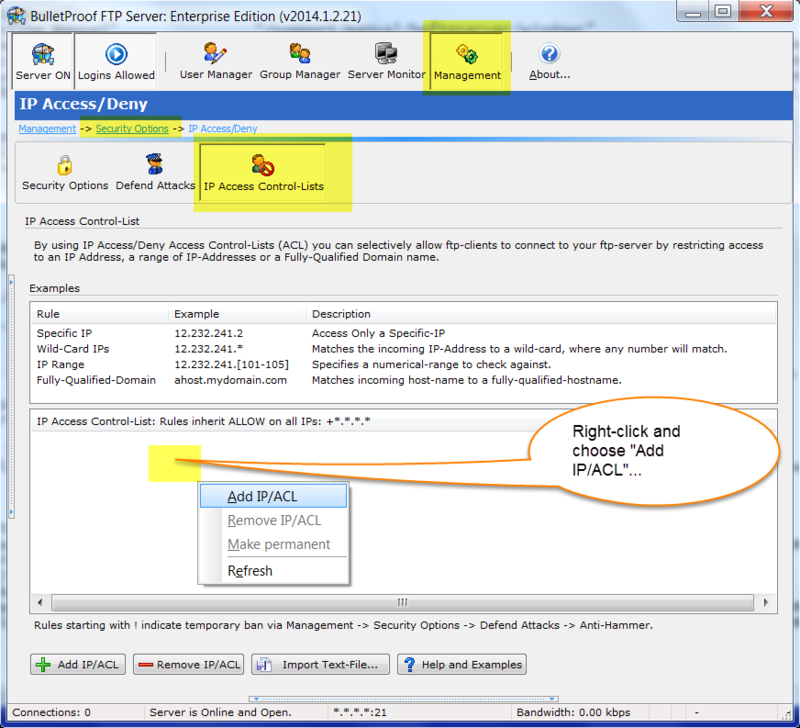 In this example, you’ll see the DENY rule being made for “-54.153.69.28” and you’ll see the ftp-client disconnect and then attempt to reconnect again, only to be refused access. 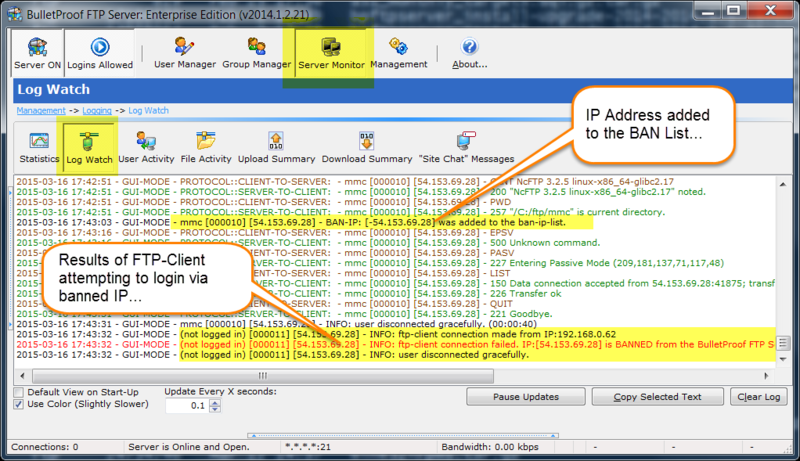 In this example, you’ll see the ftp-client from “-54.153.69.28” is denied. This is because the IP/ACL was converted to a “whitelist” with a single ALLOW rule and “+192.168.0. 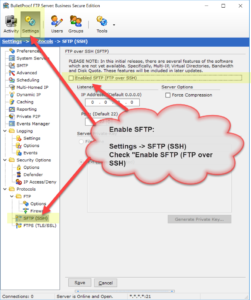 *” does not match the incoming ftp-client.